The price may look attractive, but performance is at times sketchy; overall, the drive fails to impress. (+) Bang for the Buck: Low price per GB; faster than HDD; decent endurance. (-) Cheapskate: Questionable performance; not much cheaper than faster drives; 3-year warranty. Recently, we’ve launched a new SSD test suite, reviewed our second NVMe drive in the Samsung SM951, and we’re going through a backlog of recent SSDs and reviewing those we’ve missed. Some of these are new NVMe drives, others are high-end SATA offerings, and still others are value propositions. The OCZ Trion 100 falls squarely into the latter category, and it’s priced accordingly. We received the 480GB model for review, and we’ve run it through our test suite and used it for the past month or so. As the first new SSD from OCZ post-Toshiba buyout, the drive is important in that it can help OCZ to regain some of their lost stature. Not to spoil the party, but that’s not going to happen. OCZ Trion 100 on the left, Corsair Neutron XT on the right. The controller for the Trion 100 is officially a new controller from Toshiba, but given the similarity to other SSDs on the market, it looks like the controller is actually a Phison S10, potentially running Toshiba-customized firmware. We have a Corsair Neutron XT 480GB SSD, shown above, which uses the Phison S10; similarities in appearance pretty much confirm that these are fraternal twins at the very least. 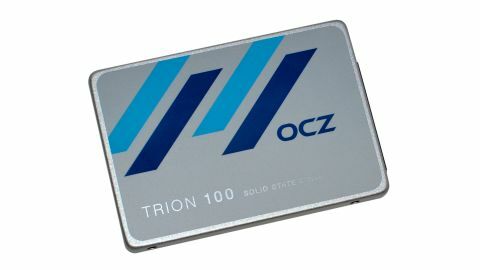 What’s different is that the OCZ Trion 100 uses TLC NAND whereas Corsair's Neutron XT uses MLC NAND. That’s why there are more NAND packages on the Crucial drive despite it having the same capacity. Lest there be any confusion, let’s be clear: TLC is not actually better than MLC; in fact, it’s generally worse. The advantages of TLC are almost solely related to cost savings on the part of device manufacturers, and hopefully those savings are passed along to the end user. Where SLC (Single-Level Cell) NAND stores one bit per cell, giving it only two states to track (0 and 1), MLC (Multi-Level Cell) NAND stores two bits per cell and has four states to track (00, 01, 10, and 11). TLC (Triple-Level Cell) NAND takes things a step further and stores three bits per cell, which requires tracking eight states (000, 001, 010, 011, 100, 101, 110, and 111). The difficulty with TLC is that NAND deteriorates over time, making it harder to differentiate between the various stored charge states in a NAND cell. This usually requires additional error checking functionality and improved controllers, but TLC NAND will always wear out faster than MLC NAND, which in turn will wear out faster than SLC NAND (all other factors being equal). The first consumer-level SSD to use TLC NAND was Samsung’s 840 EVO line, and that was followed by Samsung’s 850 EVO (with TLC V-NAND). As a manufacturer of both NAND and the SSD controllers, Samsung is in a great position to leverage their manufacturing prowess to gain an advantage over their competition, and they’ve done precisely that. Even today, there are only a handful of TLC SSDs compared to numerous MLC SSDs…but the transition is underway, with most manufacturers planning to introduce TLC drives this year or sometime in 2016. With Phison’s S10 controller now supporting TLC, OCZ is basically the first of what will likely be many companies to use this combination. The primary benefit of TLC drives is going to be price per GB, and right away we see some impressive showings from OCZ’s new drives. The Trion 100 480GB model we’re looking at today currently costs $159, which is about as low a price you’ll see for a 500GB class SSD. That gives us a price per GB of $0.331—not bad at all! But the reigning champion of budget SSDs is Samsung’s 850 EVO 500GB, currently priced at just $173 and sporting 20GB of extra capacity; the result is a very close $0.346 per GB. Or there’s the Crucial BX100 500GB, also with 20GB of extra storage, but priced at $160: That’s the winner for the lowest price per GB of modern SSDs, at $0.32 per GB. Unfortunately, we don’t have a single Samsung 850 EVO in our test results (yet! ), but we know roughly where it stands by looking at our RAID 0 850 EVO configuration; maximum throughput would be lower, but random write speeds will be pretty close as RAID 0 doesn’t help much there. Alternatively, the 850 EVO tends to be slower on write speeds compared to the 850 Pro, but with good read performance. Anyway, we’ll be testing a larger 850 EVO without RAID in the near future and will add that to these charts; we’re also working on getting the Crucial BX100 500GB in for testing, which will be the best competition on the budget end of the spectrum. The sequential read speed is basically right there with the rest of the SATA SSDs, but that’s as good as things get. Sequential writes speeds are well behind, thanks in part to the Phison controller, plus some help from TLC NAND. Random read/write speeds also fail to impress, and mixed read/write performance in IOmeter shows that the drive is clearly not geared towards heavier workloads. The real world file copy test confirms these results, with throughput that’s basically half of what you’d get from a better SATA SSD. But if you’re just going to be doing light computing, does any of the above actually matter? PCMark 8 once again gives us an overall score that’s very close to the other SSDs, and even the fastest NVMe drives only score five percent higher than the Trion 100. Which means the usefulness of the Trion 100 really comes down to what you’re doing and how low the price falls. Loading up games, applications, or booting Windows off the Trion 100 isn’t substantially slower than doing those same tasks on the Samsung 850 Pro or even the Intel SSD 750. There’s a huge jump in going from a hard drive to a decent SSD, but the jump from a moderate SSD like the Trion 100 to the best SSDs is much smaller. This is not to say the Trion 100 is a great SSD by any stretch. Looking at our eleven charts, the Trion 100 places dead last in eight of the benchmarks. Just about any SSD made in the last two years will at least match it on performance, and many of them will beat it. Head-to-head, even the SF-2281 tends to be a faster drive overall. Ouch. If the primary difference between the Neutron XT and the Trion 100 is the use of MLC vs. TLC NAND, we can also see that the TLC memory used by OCZ is part of the problem, as the Neutron XT wins 10 of the 11 matchups. Of course, the OCZ drive is priced as a budget offering, which might be enough. There are less expensive SSDs in the 480-512GB range, but many of them use more power, so they’re not a good fit for laptop users. Then again, the Samsung 850 EVO isn’t much more, and it should easily surpass the Trion 100. If all you’re interested in finding is an SSD that’s “fast enough,” the Trion 100 is still a healthy bump in performance from a hard drive, but in the greater market it ends up looking pretty weak. It’s not even the least expensive 500GB class SSD, as other drives with the Phison S10 can be had for as little as $140. The endurance is okay, at 120TB (110GB per day for three years), but the 3-year warranty is on the stingy side (the 500GB Samsung 850 EVO for example is a 5-year/150TB written warranty). It’s difficult to make a living selling budget computer hardware, as there’s a certain minimum cost involved with producing and marketing a product, and the competition can be very cutthroat. OCZ is lucky to be part of the Toshiba family now, which means they should have lower costs when it comes to NAND, but even with those advantages there’s not a lot going for the Trion 100. If you want to make the least expensive 500GB class SSD possible, we understand corners will have to be cut. What happens when you cut those corners and still end up being more expensive than other options? You have a product that has failed to hit its niche. At this point, Toshiba and OCZ have limited options: they can either improve performance with a firmware upgrade (unlikely), lower the price, or just carry on as though nothing is amiss. The latter is the most likely to occur, as there’s a good chance the hardware in the Trion 100 is already being sold to laptop OEMs by Toshiba at lower prices. Making a retail drive doesn’t really hurt anyone, other than OCZ’s already tarnished reputation, and anyone going after a budget SSD will still end up with better than hard drive performance, and better than hybrid drive performance as well. By that token, the Trion 100 is okay; it’s just that you can do better for the same price.